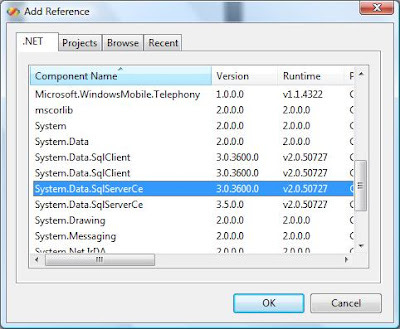 Many people in the community are reporting inconsistencies when viewing the version of SQL Server CE 3.0 through File Explorer file properties and Visual Studio Add Reference dialog. I use SQL Server Compact 3.5 (note the naming differences) now which seems to be OK in terms of versioning. But earlier versions (3.0, 3.1) don't. See the screen shots attached. As per the file system. This diference is related to the build process between Mobile and Desktop assemblies. 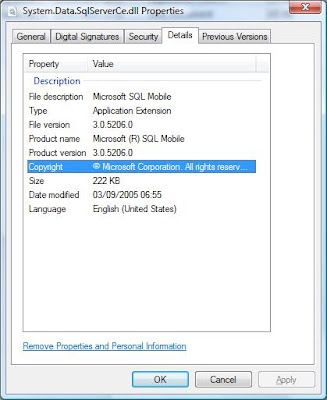 Microsoft has partially fixed SQL Server CE 3.1 but fully fixed SQL Server Compact 3.5.